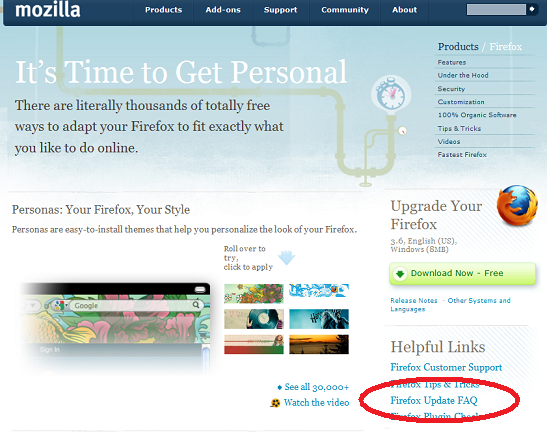 Over the past year, we set out to identify and solve any possible pain points that might arise during a person’s experience downloading and installing Firefox (previous posts are here, here, here, here, and here). 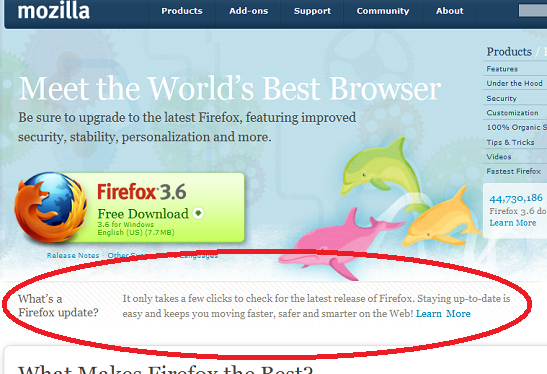 Thanks to feedback from users, and some resulting product changes, we can now safely say that there are no issues confronting new users when installing Firefox for the very first time. Last week, we re-ran our installer feedback mechanism for a short period of time. 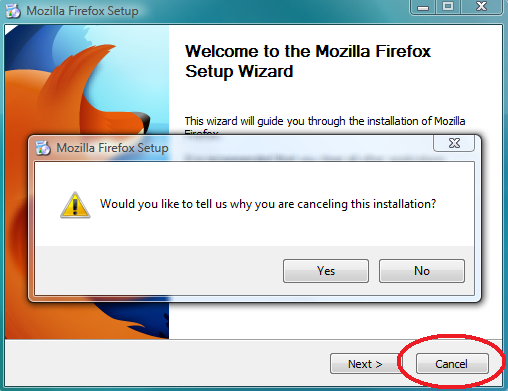 If a user clicked “cancel” while walking through the Firefox installer, they were asked if they wanted to provide feedback. While we still have plans to tackle the remaining big slice of the pie (see concluding paragraph), we were able to successfully solve the red and green pie slices from last time. In our latest feedback results (pie on the right), the big pie slice now represents nearly 100% of the total feedback (the previously seen categories virtually evaporated). One way to interpret this is that we’ve now successfully identified and resolved 3 of the top 4 issues originally encountered by users. Thanks to Rob Strong, the Firefox team, the Funnelcake team, John Slater, and Laura Mesa, among others, for implementing the changes highlighted above. 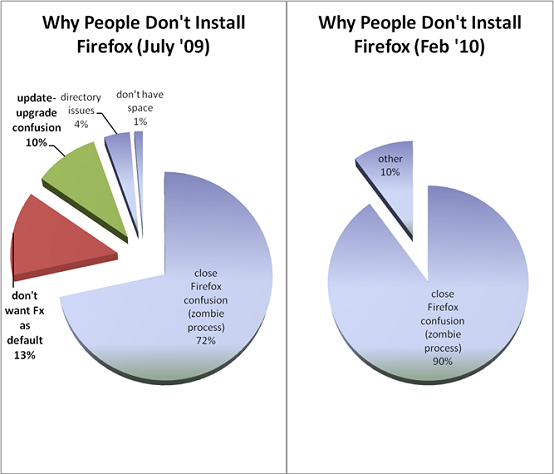 Lastly, there remains one outstanding problem for installers of Firefox – “it tells me to close Fx, but it’s not open” (the big pie slice in the charts above). 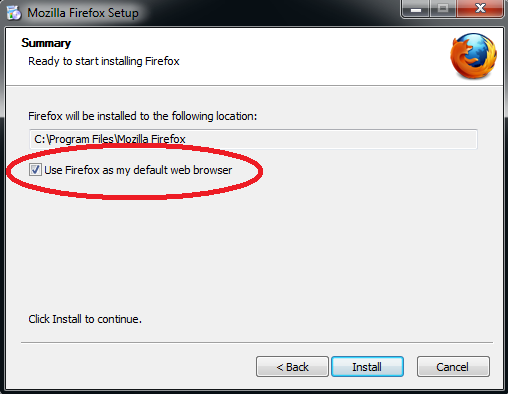 This issue affects people who already have Firefox and are attempting to reinstall it, and as we’ve noted previously, this cohort becomes fairly frustrated during the experience. Some fixes are starting to be contemplated (e.g., bugs 496207, 544356)… and I’ll make sure to talk more here once some progress is made. Could you explain the rationale for this? I might think I downloaded the wrong package, that it was only an incomplete upgrade and not a full install, and therefore might cancel out. I think that you could add a text together with the Upgrade button saying something like “this is the same as a reinstall, but with a newer version then the one you have installed, and your old profile data will remain intact”. That would probably solve issues like the one in Gc’s comment above, “I might think I downloaded the wrong package, that it was only an incomplete upgrade and not a full install, and therefore might cancel out”. The important question is, has the total number & percentage of people with issues gone down, or have the other/zombie issues risen to compensate for your improvements?